Hortus Camdenensis | Hippeastrum vittatum (L’Hér.) Herb. A spring flowering bulbous perennial with 3-6 funnel-shaped, red-striped flowers, the strap-shaped leaves emerging after the flowers. To 90cm. [RHSE, Hortus, Baker Am.]. 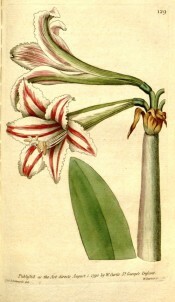 First botanically described as Amaryllis vittata by L' Héritier [Sert. Angl. p.13/1789]. Placed in Hippeastrum by Herbert in 1821 [Herbert’s Appendix p.31/1821]. ‘Linnaeus, the Son, took much pains in new modelling the generic and specific characters of this genus; as may be seen in the Hort. Kew: Mons. L' Héritier, when in England a few years since, saw this species, described and named it Vittata. Of what country it is a native is not known with certainty, most probably of the Cape, was first introduced into England by Mr. Malcolm. Our figure was drawn from a fine specimen which flowered this spring with Messrs. Grimwood and Co. Kensington. It usually flowers in April or May, but may be forwarded by artificial heat. It rarely puts forth offsets from the root, but readily produces seeds, by which it is propagated without difficulty. When it blossoms in perfection it truly deserves the name of superb, which Mr. Aiton has given it, the stem rising to the height of three feet or more, and producing from two to five flowers.’ [BM t.129/1790]. The Botanical Register figures Amaryllis vittatum var. Harrisoniae, ‘Mrs Harrisons’s striped Amaryllis’. This plant differs from the species in having larger and more tubular flowers, more faintly striped with red. [BR f.988/1826]. Amaryllis vittatum was introduced to Britain in 1769. [PD]. Listed in all published catalogues [B.222/1843]. Hippeastrum ambiguum var. tweedianum Herb.